Who we talked to and where they were from? We first talked to Eladio and Dennis and the kids in the Dominican Republic. They told us about different things going on in the Dominican Republic. One of the things they told us about was that they have paid slavery there which doesn’t happen in Canada so it is very different. Another thing is that the government just paid billions of dollars to get a coal power plant even though there is no coal supply there so they would have to get it imported, here we are moving away from that and using mostly renewable energy. Then we skyped Mr. Fogarty and his students in New Brunswick. He told us that they have been working on engineering brightness for over 2 or 3 years. He gave us tips and ideas about it and what to do and what he and his class did. solar power or human power. We couldn’t use batteries though because most people wouldn’t have access to outlets so they couldn’t recharge their batteries and most couldn’t afford to keep buying new batteries. How did I feel about the experience? I think that I learned a lot about problems going on in the world that I don’t even have to think about because I just flick the switch and the lights go on and I can see. I didn’t realize before that this would be a problem but I get it new and understand that it is important to have light. What was our groups general ideas? Our group decided to do fundraising. We could possibly work with another group and have a bake sale. We also would like to work with another school to fundraise there. We have decided that we would raise money. 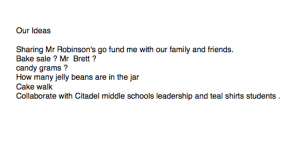 We could do a bake sale and possibly pair up with another group and maybe work with Citadel Middle School and their leadership team to raise money at their school. We have contacted Castle Park Elementary to help us. We have contacted Ms. Tomkins who is the principal. And hopefully she will get some of the other teachers and groups to see what they think and help us out.